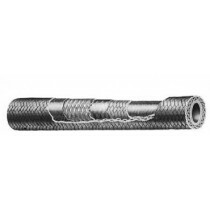 This standard hose is used in medium pressure A/C hydraulic, fuel, oil and coolant systems. An inner tube of seamless synthetic rubber is reinforced with a synthetic-impregnated single-wire braid over a single cotton braid and an outer cover of synthetic-impregnated oil-resistant cotton braid. Operating temperature -65 to 250F. Conforms to MILH-8794 (supersedes MIL-H-5511A). Used with Aeroquip 491 hose fittings. SERIE 303 Il y a 2 produits.